Experimenting when baking is not, if ever, recommended, but as they say (whoever they are..) sometimes the best recipes are invented from either mistakes, or just going with whatever you have, crossing your fingers, and trusting your luck (and your oven). Baking is, in reality, a chemistry experiment, as recipes and methods need to be followed to the last gram/ounce etc. This recipe came about as a result of finding out …. too late…. that I did not have enough Strong Bread Flour for the bread I had intended to make. So, thinking quickly about what I could add, so as not to alter the consistency too much, I had a pack of Oatmeal in the cupboard, and decided… yes… that’ll do!! Pre-heat the oven to Gas Mark 4/180°C/350°F. Use some olive oil to grease a 2lb loaf tin. *Porridge Oats and Oatmeal are, more or less, the same thing. If you don’t have a pack of Oatmeal, just blitz up some Porridge Oats in a food processor instead. Place the water and milk in a saucepan, and heat this on the stove-top to just warm. Set aside. Put the strong white flour, oatmeal, olive oil, salt and yeast in to a bowl of a stand-alone mixer, and combine. Pour the water and milk into the bowl of dry ingredients, stir with a wooden spoon to get things started, then using a dough hook, let the machine do the kneading work for about 10 minutes, and scrape it down every couple of minutes or so, just to blend all the ingredients. If you don’t have a mixer, this recipe is easily made in a large bowl, with a wooden spoon and some kneading on a floured table or bench. After 10 minutes of kneading, form your dough into a ball, and place it in to a clean, oiled bowl, cover with cling film, and place in your fridge for as long as you can leave it, or have time to do so. 30 minutes, at least, is ideal. When you are ready to bake the loaf, take it out of the bowl, knock it back by punching the dough in the centre. Form it to the approximate shape of the tin you will be using. Brush the top of the loaf with milk, and sprinkle on the porridge oats. Bake it for an hour, in 3 x 20 minute segments, turning the tin after each segment. Test with a skewer to make sure your loaf has fully cooked through. Place the tin on a wire cooling rack, and leave for at least 10 minutes before turning it out. After another 10 minutes, wrap your loaf in a clean tea-towel and allow to cool completely. And there you have it! 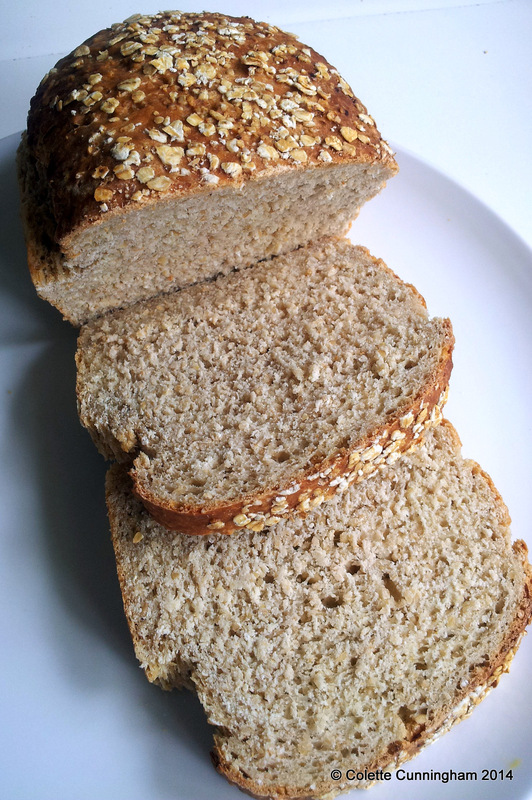 An oatmeal yeast loaf which started life as something completely different. Thanks Margaret, let me know if you do try the rolls. Just found your blog and i love it 🙂 A quick question, is it possible to blitz regular porridge oats in the food processor to achieve the oatmeal? thank you.